Former New York Assembly Speaker Sheldon Silver (D.) was sentenced to seven years in prison Friday. Silver initially received a 12-year sentence after being convicted in the case in 2015, but that conviction was overturned by an appeals court, NBC News reports. This spring, a jury found him guilty once again of taking nearly $4 million in return for legislative favors. Silver directed grants to a cancer researcher who then referred patients to Silver's personal injury law firm, enriching him in the process. Bobby Cuza of Spectrum News NY1 reported from the courtroom that "it was an act of mercy by the judge," U.S. District Judge Valerie Caproni, who took into account Silver's health and age. But Caproni also castigated the 74-year-old as being "exactly what people think all politicians are: deeply corrupt," and she said Silver's actions were motivated by "unmitigated greed." Silver also has to pay a $1.7 million fine and forfeit the money he earned from his illicit schemes, which amounts to at least $3.7 million. The former assembly speaker pleaded for mercy and said "I have brought great distrust to New York government," and wrote that "I pray I will not die in prison." His sentencing comes less than two weeks after former New York Senate leader Dean Skelos (R.) was convicted of extortion, wire fraud, and bribery. 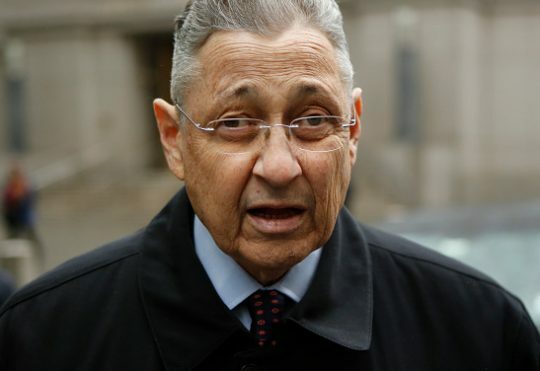 Silver had served as speaker of the New York Assembly for 21 years when he resigned in the wake of his 2015 arrest. This entry was posted in Politics and tagged Corruption, New York. Bookmark the permalink.